I have discussed the angle of nostril piercings pretty thoroughly in my previous blog entries. 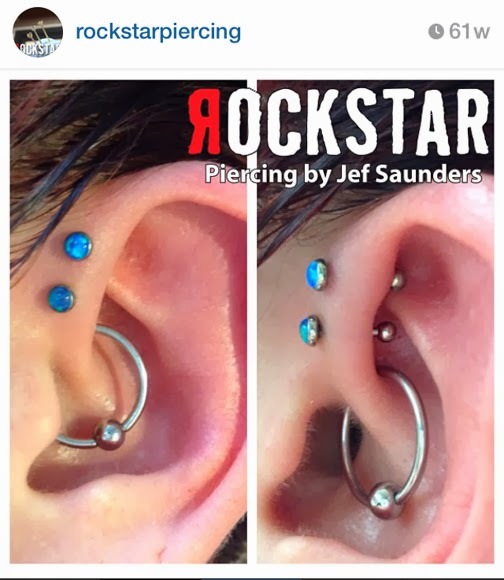 In most instances, perpendicular piercings are going to look best and heal best. With the exception of nostrils pierced with rings, in which case my client and I agree to deal with longer healing times and more complications so the piercing is aesthetically perfect for a ring. So, now all that we, the piercers have to do is set the needle at the right angle and push, right? Problem solved! The arrows represent the pressure from the cork board, which is equal on all sides. When you press a pin or thumbtack into a cork board to hang up a sick punk flyer or a Garfield comic strip, you put pressure directly at the back of the pin, and the pin hits at the perpendicular surface and goes straight in. The pressure acting on the pin is equal at the top and the bottom (and the sides), and this aids the pin in going straight. Now, let’s look at a modern piercing needle. This is totally different. It is essentially a metal tube cut at an angle and sharpened (there is much more to it than that, but let’s not get distracted in this blog entry). That cutting surface presents a problem. The arrows represent the drag pushing the needle in a downward angle. Here’s what it actually does. The pressure from the tissue on the cutting surface pushes the needle “down”. I was introduced to this idea at the Fakir Intensives in 1999, and they call this needle drift. I’ll be honest, it was 2 years of piercing in a busy shop before I really understood what was going on. Of course, this is very easy to visualize on a 6 gauge needle. It is exceptionally challenging to accommodate for this on an 18g needle. 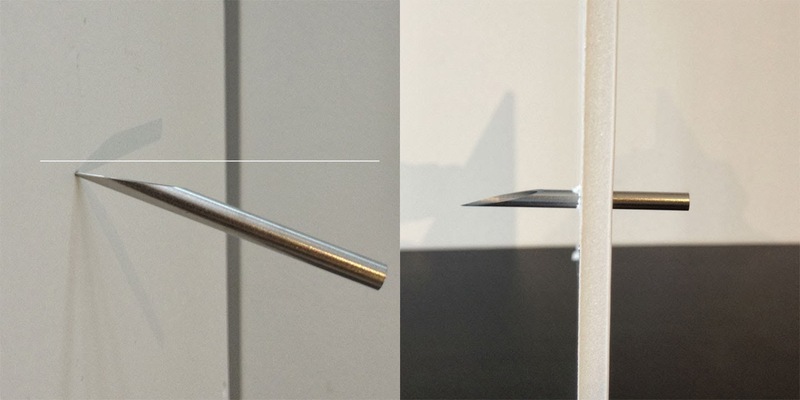 I have demonstrated this showing the bevel facing up, but it is the same no matter which way the needle bevel is facing. 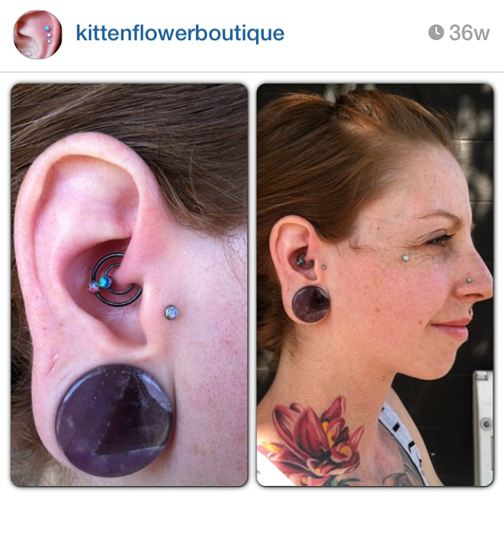 In addition, at the Association of Professional Piercers Conference June 8-13, 2014 there will be a class on needles called Needles: the Cutting Edge. This class will be taught by Luis Garcia and Brian Skellie, and I would strongly suggest it if this blog is intriguing to you. I don’t intend to answer the needle drift issue in this blog, I merely want to introduce the concept before I start approaching actual piercing techniques. I will be demonstrating how to avoid needle drift for perpendicular piercings, and how to use it to our benefit when we do angled piercings for rings. I will also be posting technique videos. These blog entries haven’t been about health and safety, but that doesn’t mean it won’t be demonstrated. To my colleagues: if you have comments or critiques on health and safety, placement, or technique - let’s discuss them! I would very much like this to be a learning experience for all involved, myself included. Full Disclosure: I am an instructor for the Fakir Intensives and I am also teaching classes at this year's Association of Professional Piercers conference. Why do I include this disclosure? This is a critical thinking skill: a healthy dose of skepticism should be applied to claims made by salespeople (like me, in this instance). I think it is ethical for me to explain that I have a vested interest in people attending both the Fakir Intensives and the APP conference (even if I don't benefit financially from them). I love the Super Bowl. I love Football. Every year, my friends and I go to a restaurant and eat chicken and then go to a football field (weather permitting) and play flag football until the Super Bowl happens. This year, while there was a lull in the conversation, I hash tagged a photo I was posting on the Rockstar Body Piercing Instagram page #DaithBowl . Just as a joke. This happened approximately 1:30 EST on February 2nd, 2014. 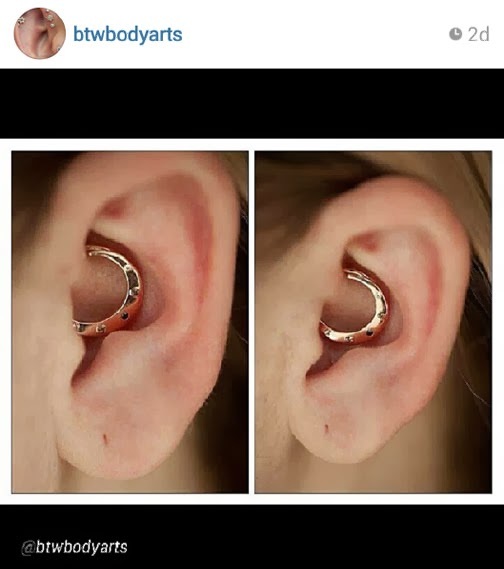 I thought about it for a second, and texted a couple friends and asked them to post daith pictures as well, with the same hash tag. The first two to respond were Luis Garcia and Bryan Thomas, and it just so turns out that these were the right two people for the job. Within an hour, we had 100 posts. Within 2 hours, 230. We eventually peaked at 285 posts on Instagram. Flawless heart execution with a great cluster by Nate Janke. 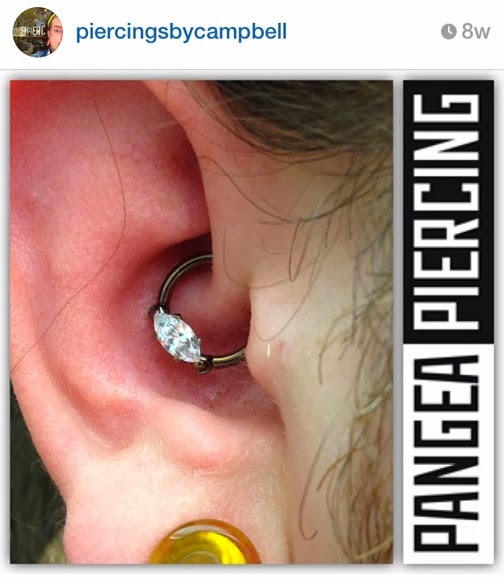 A 2g daith piercing. 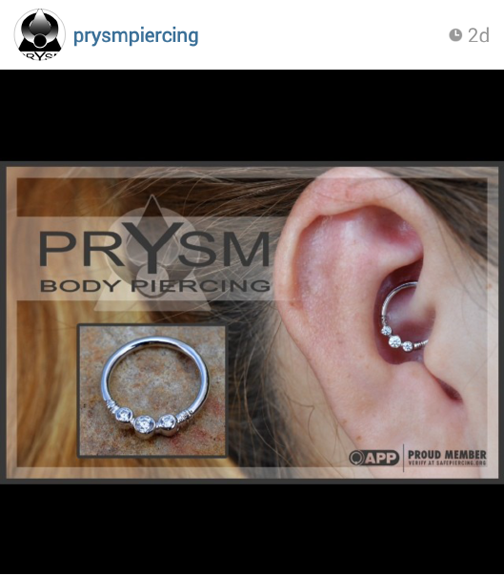 Probably one of the only 2g daith piercings in the world. By Luis Garcia. Perfect jewelry size and depth by Bryan Thomas. There were a lot of double daiths, but this combo with a double captive gem bead is really special. By Kitten Flower Boutique. Joshua Campbell nailed the angle and has an innovative approach to jewelry selection. Got to love it! 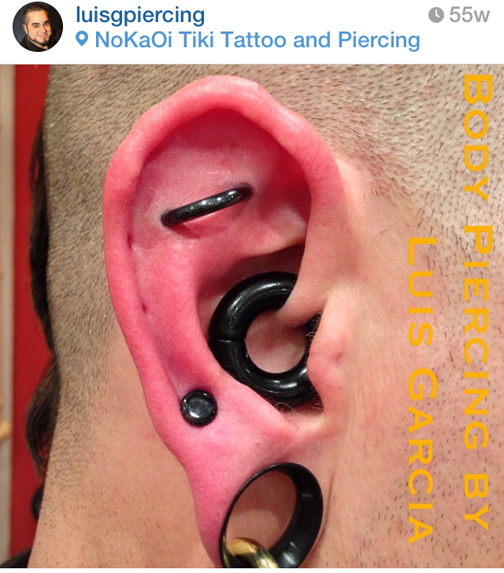 These were not the only great daith piercings, and for every one I posted there were two I could have. Definitely do yourself a favor and look through them all! Thanks to everyone who participated, it was a really fun thing to do and I'm hoping we can make another "viral portfolio post" happen again in the future. I also wanted to take a moment to turn this into a learning experience, because this is a unique opportunity to do so. It turns out that some piercers struggle with the angles of daith piercings and perhaps these contrasting diagrams will help. Notice the angle of this piercing is NOT straight up and down, it is angled significantly in toward the ear canal on the bottom. The ring compliments the conch. That is crucial, the antihelix tissue should really compliment the ring. Also, the ring is large (usually minimum 3/8 diameter, although usually larger in our studio). The ring is deep! 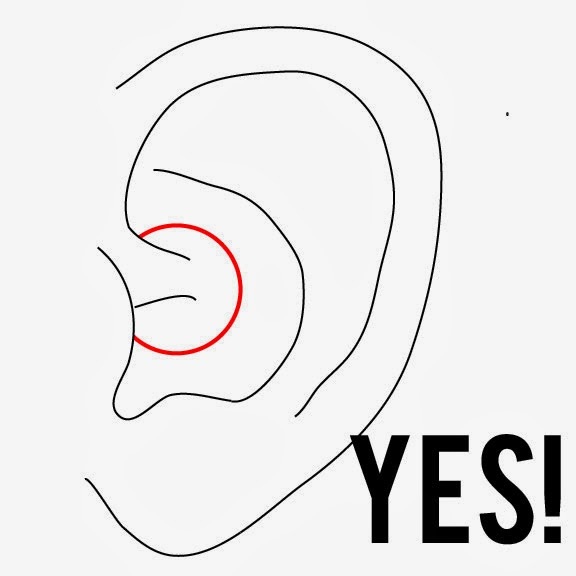 Now, that can be taken too far, but if you don't have an eye for the depth yet, really look at the submissions to the Daith Bowl and you will start to grasp it. 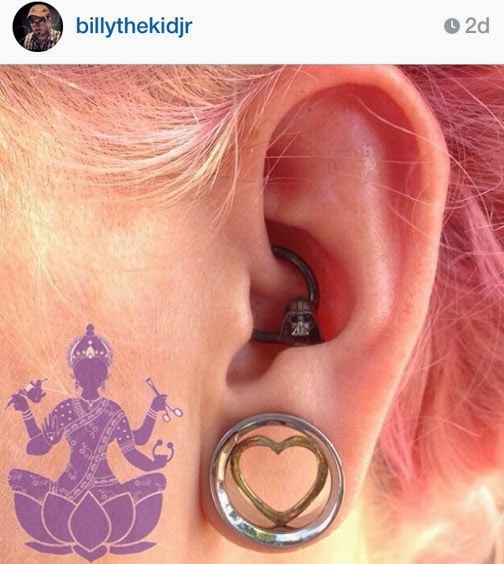 Above is a daith pierced almost vertically with a small ring. 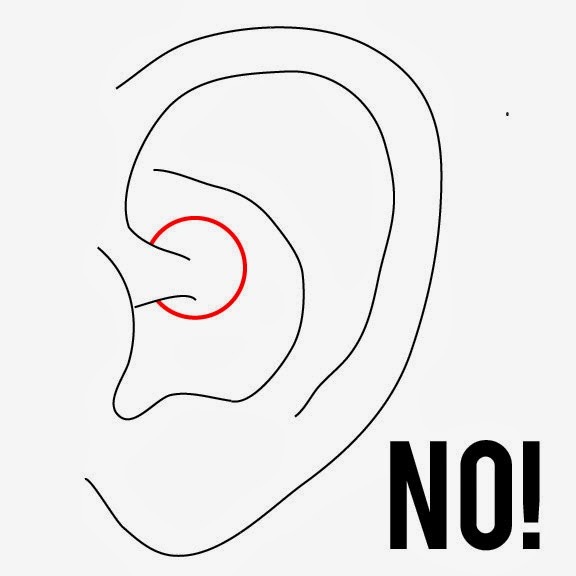 Not only does this not compliment the shape of the conch, it is in very thin tissue and is likely to flop forward when your client leans forward. 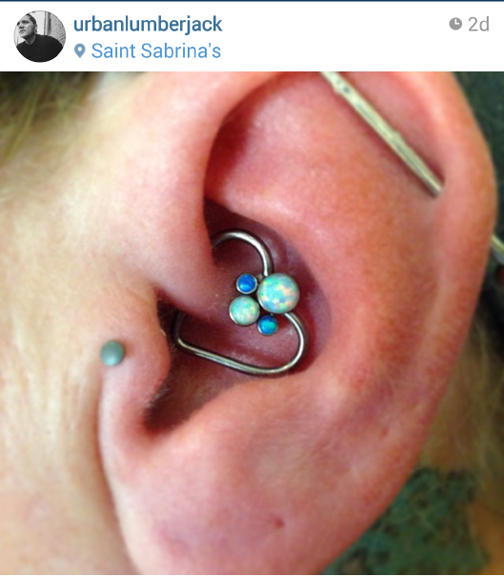 This is also so close to where you might place a rook, and this daith placement basically eliminates a rook piercing as an aesthetically pleasing possibility. You can see from this diagram that the hearts, too, are a little deep. Potentially shallower depending on how deep the conch is, but still, many submissions were too shallow. Sure, this might heal, but it will always "flop" and it has much more potential for migration. 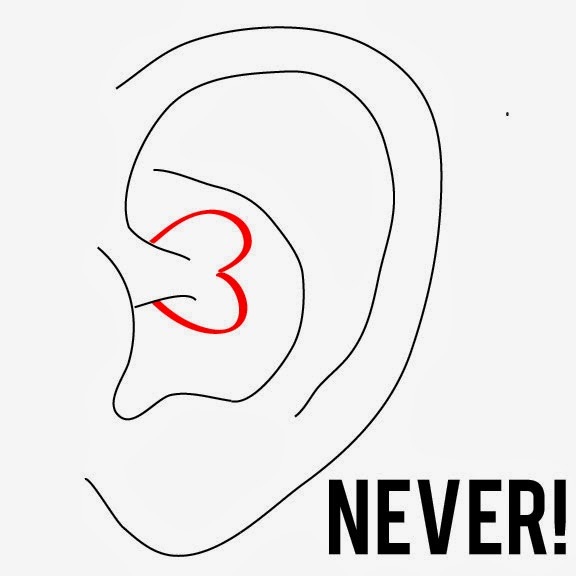 Ear cartilage piercings can "settle" in to place but should never migrate. 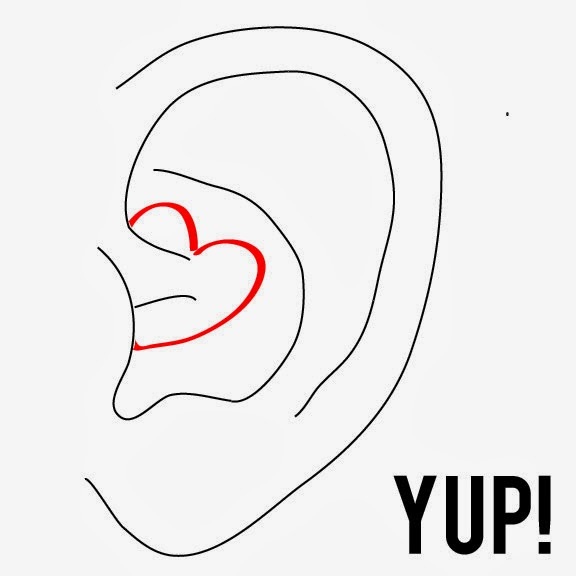 One note on daith hearts: they work really well because they put a straight piece of jewelry (the flat part of the heart) into a straight piercing. My own daith didn't heal well because of the curvature of the ring I was wearing. Only when I switched to a heart was the piercing comfortable for me. 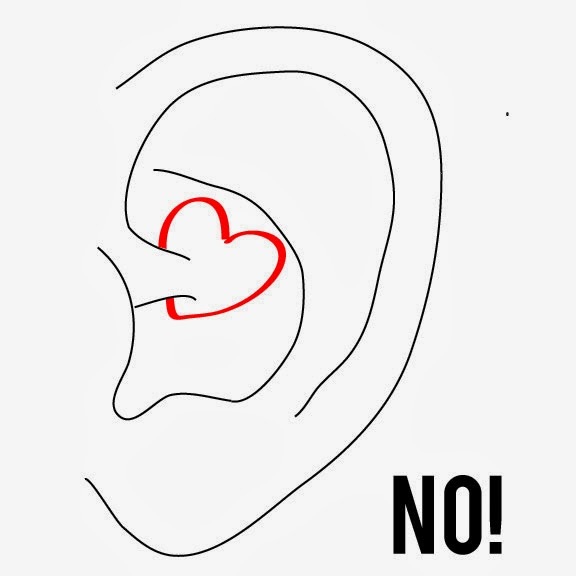 The curvy parts of hearts should NEVER be in the piercing channel, and especially not the point of the heart. Thanks to everyone who made this a mini-viral experience. I sincerely hope this blog post was insightful! Thank you to Luis Garcia and Bryan Thomas for all their help!